Back in April, the Union Leader interviewed me and asked all sorts of questions about my life and writing career. Want to know what I consider an "average vacation?" Or how I got started as a writer? Or what I've got planned for the future? Then check out my interview with the Union Leader to learn everything you ever wanted to know about me! On a recent trip, David Meyer searched for Mayan ruins in Mexico (stumbling on them everywhere), swam with sharks in Belize (sustaining a bite from something), and was swarmed by soldiers in Guatemala after his driver hit a police car (ending up with stitches). As he puts it, “that’s kind of an average vacation for me.” Meyer’s thirst for adventure has taken him down into the arteries of underground New York City and all over the world. 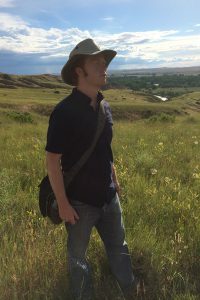 It’s also led him onto the page, where he’s found success as the self-published author of the Cy Reed Adventures treasure hunter series and a new Apex Predator monster series. Having sold hundreds of thousands of books since his first novel, “Chaos,” came out in 2011, the 38-year-old has big ambitions for his storytelling future. For the rest, read the full interview at the Union Leader. Want to know what ancient Wonder of the World would've been on the top of my checklist to explore? How Cy Reed differs from Indiana Jones? Why I count cartoonists like Chester Gould, Al Capp, Milton Caniff, and Alex Raymond amongst my favorite authors? Then check out my Manybooks interview to learn all about my books, inspiration, life, and more! Author David Meyer is not afraid to get his hands dirty when it comes to doing research for his action/adventure thrillers. From searching for ancient Maya ruins to close encounters with sharks, his own adventures come close to rivaling that of Cy Reed, his lead character in Torrent. Today we talk to David about his fascination with ancient architecture, designing his own book covers and what we can expect from him in the future. Please give us a short introduction to Torrent. 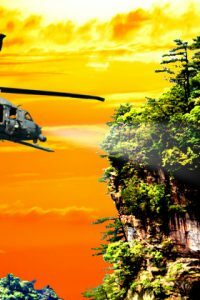 Torrent is an action/adventure thriller, perfect for fans of Indiana Jones and Dirk Pitt. It follows Cy Reed, a renowned treasure hunter and salvage expert, as he hunts down the deadly secrets of a lost Maya vault. What fascinates you about the pyramids and other ancient architecture? Your book contains a lot of information about Mayan culture. How much research did you have to do about the subject? Plenty, much of which was gained on the ground. Awhile back, I spent a couple of weeks in Central America, trekking through Mexico, Guatemala, and Belize in search of ancient Maya ruins. It was a memorable trip, full of adventure. In Guatemala, our vehicle smashed into a police car in front of a military outpost. The driver was hauled off to jail and I needed stitches to close up my leg. A few days later, I got bit while swimming with sharks in Belize. And not long after that, I bogged down on a swampy jungle road late at night, the sounds of eerie jaguar calls ringing in my ears. Now, those exact experiences didn’t make it into Torrent. But in many ways, they formed the spirit of the book. For the rest, read the full interview at ManyBooks. 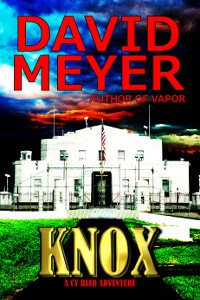 "Meyer's writing is the best parts of the style of a Michael Crichton or a Tom Clancy. He also gives a supernatural, Stephen King-type feel to his personification of the creepy forest and its dark secrets. This adventure is bold and exciting, and postulates some real-world concerns and a fatalistic future. 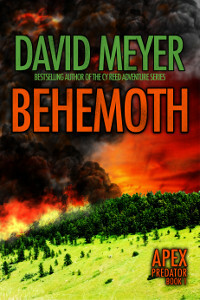 I'm thrilled that "Behemoth" is the first book in Meyer's "Apex Predator" series - and only slightly miffed that I must wait to find out what happens to these characters next." Read the rest here. And if you haven't read BEHEMOTH yet, pick up your copy today! I recently decided to initiate a bit of a rebranding campaign for my books. What's that mean? 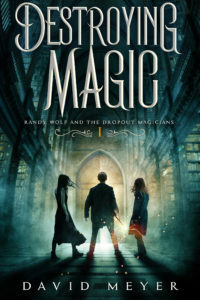 New covers! And, at least in the case of KNOX, a new title as well. As most of you know, I design all of my own covers. 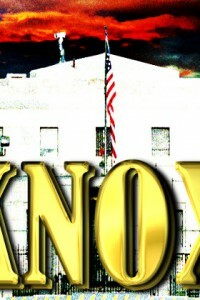 And I was never terribly fond of the cover for KNOX, the latest Cy Reed Adventure. 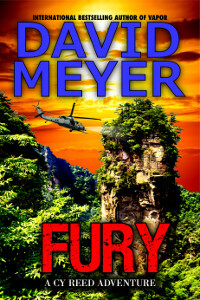 So, I renamed the book, FURY, and created a new cover for it. You can see it below. If you haven't bought FURY yet, now is the time! Are you ready for BEHEMOTH?! I've waited a long time to say this … BEHEMOTH is here! BEHEMOTH is the first book in my brand new Apex Predator series and it's full of all the things you've come to love about the Cy Reed books … explosive action, multi-layered mysteries, shocking twists, and vicious monsters. BEHEMOTH has been in the works for a while now. I even did a stint in a well-known survival school to prep for it. The result is something I'm extremely proud of and I'm not exaggerating when I say it's the best thing I've ever written. Now, let's take a look at BEHEMOTH! "Zach Caplan halted at the corner of 73rd Street and York Avenue. His eyes closed over. His head tilted skyward and he perked his ears. The cry had rung out from half a block away, filling his brain with its strangely pleasing resonance. There was something horribly wonderful about the cry of prey, about the roar of a pursuing predator. Horrible because of death’s finality. Wonderful because death, in so many ways, fostered new life. For the first time in forever, Caplan felt at home." The Vallerio Forest. Millions of acres of undeveloped land, cut off from the outside world by giant fences, armed guards, and government edicts. It’s widely considered an ecological paradise. But beneath its majestic canopy lies a dark underbelly of strange creatures, secret facilities, and horrifying experiments. 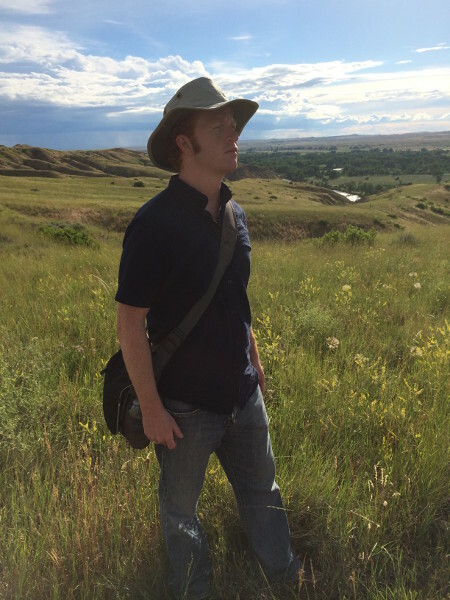 Five months ago, survival expert Zach Caplan swore off the wild and moved to New York City. But when trouble strikes his ex-girlfriend, famed biologist Amanda Morgan, he must return to the forest that nearly destroyed him. This, however, will prove far more difficult than he could ever imagine. For something is stirring within the Vallerio. Something ancient, something deadly. And as Caplan fights to untangle the terrifying truth about the dark forest, he will come to an inescapable conclusion. The fate of humanity is in his hands … and one wrong move could mean extinction. It’s time for the sixth document from our Dasnoe Expedition collection, the legendary Dasnoe Manuscript! For years, historians believed all copies of Joseph Dasnoe’s The Dasnoe Expedition had been destroyed in the infamous Treadwell Fire of 1904. But they were wrong as you’ll soon see. 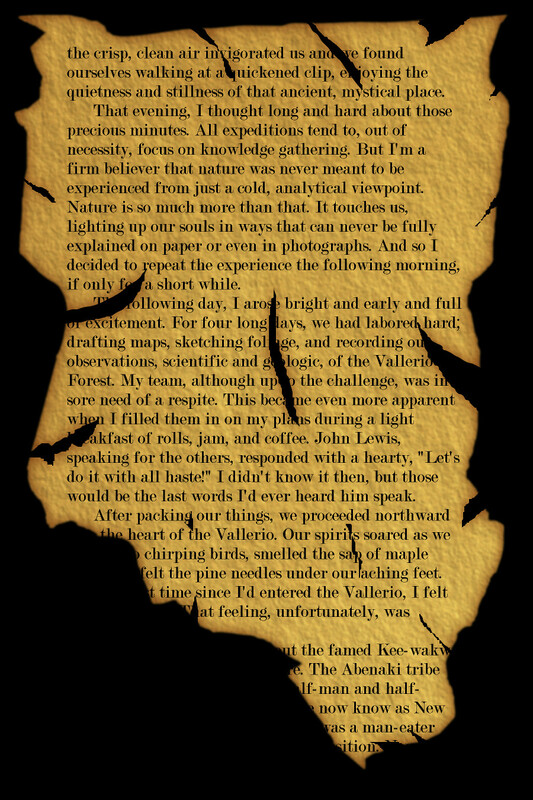 In honor of Apex Predator Thursday, I’m releasing the sixth document—the Dasnoe Manuscript—from our Dasnoe Expedition collection. As a reminder, the Dasnoe Expedition was led by famed zoologist Professor Joseph Dasnoe. Back in 1904, he received permission from Miles Spencer Corbotch and the Corbotch Foundation to visit northern New Hampshire’s vast—and largely unexplored—Vallerio Forest. Accompanied by numerous Highforth College faculty members and students, Dasnoe set forth on September 24, 1904. Just four days later, he was forced to cut the expedition short when six students fell prey to a pack of animals, widely reported in the media as wolves. Professor Dasnoe spent the rest of his short life trying to convince the public that the creatures who’d attacked his expedition weren’t wolves. Rather, they were something else. Shortly after returning from his expedition, Prof. Dasnoe prepared a manuscript entitled, The Dasnoe Expedition. All copies of the book, including the original manuscript, were reportedly destroyed in the infamous Treadwell Fire of 1904. But I’m pleased to report that a single page, definitively linked to the Dasnoe Manuscript, has now been discovered. Stored for over a century in the confines of a dusty Newark library, my archivist team stumbled on it while researching the Treadwell Fire. As you can see below, the page—while incomplete—clearly mentions the Vallerio Forest. Be sure to check out the bottom of the Dasnoe Manuscript page, which just might explain what Prof. Dasnoe thought he saw in the Vallerio on that fateful day. Our Apex Predator site continues to grow. So, make sure to stop by and leave a comment. We’d love to hear from you! Not much writing since Monday for personal reasons. Hopefully, this will change soon. Behemoth (Apex Predator 1): First draft is in progress at 26,421 words. I’ve been cycling back a lot, changing earlier parts of the book to match up with where the story seems to be going. It’s on a better track now, but still not the right one. Bunker (Apex Predator ? ): First draft is paused at 6,090 words. Collapse (Cy Reed Adventure #5): First draft is finished at 74,535 words. This week in Cy Reed’s journal, Cy establishes an Infinity Subway Theory. Did the eight missing children disappear into Manhattan’s locked subway tunnels? How? And why? We’re pleased to release our 12th page of Cryptic today. Cryptic is our working title for Cy’s personal journals during the time period encompassed by Chaos. It focuses largely on his side investigation into a mysterious—and deadly—group known as the Infinity. This week’s entry, “Infinity Subway Theory,” is the last of a four-part mini-series. Here’s the first part, second part, and third part. “Infinity Subway Theory” contains the final inside page of a flyer Cy found just outside the 51st-53rd Street station complex. Like the other pages, it depicts a character from Captain Jellybones, a popular Internet cartoon series. An unknown person created the flyer in order to call attention to the sudden disappearance of eight children from extremely wealthy Manhattan-based families. In the margins, you can see Cy begin to theorize about how these kids, watched over by so-called “helicopter parents,” disappeared from their respective apartments without a trace. Manhattan’s subway tunnels, closed off at the time due to a labor strike, appears to be an important piece of the puzzle. You never know when an idea will come together. Setting specifics aside, two particular slices of history have always intrigued me. One deals with lost technology and a strange mystery of history. The other is an urban legend about a deadly weapon. They seemed perfect for the Cy Reed universe, but I could never figure out how to turn either one into a book. Well, a few days ago something clicked and I started thinking about what would happen if I combined the two slices. Part of the story crystalized in my head and I quickly scribbled down a few notes so I wouldn’t forget it. And that story will be Cy Reed #6, ladies and gentlemen. Treadwell Fire: An Apex Predator Original! It’s Apex Predator Thursday and to celebrate, I’m releasing the fifth document from the Dasnoe Expedition collection. Our archivist staff calls it the Treadwell Fire article and it provides early insight into how far Miles Spencer Corbotch, patriarch of the Corbotch empire, was willing to go in order to hush up the truth about the Dasnoe Expedition. Today, I’m releasing the fifth document—the Treadwell Fire article—of our Dasnoe Expedition collection. As background, the Dasnoe Expedition was led by famed zoologist Professor Joseph Dasnoe. Back in 1904, he received permission from Miles Spencer Corbotch and the Corbotch Foundation to visit northern New Hampshire’s vast—and largely unexplored—Vallerio Forest. Accompanied by numerous Highforth College faculty members and students, Dasnoe set forth on September 24, 1904. Just four days later, he was forced to cut the expedition short when six students fell prey to a pack of animals, widely reported in the media as wolves. Professor Dasnoe spent the rest of his short life trying to convince an uncaring public that the creatures who’d attacked his expedition weren’t wolves. 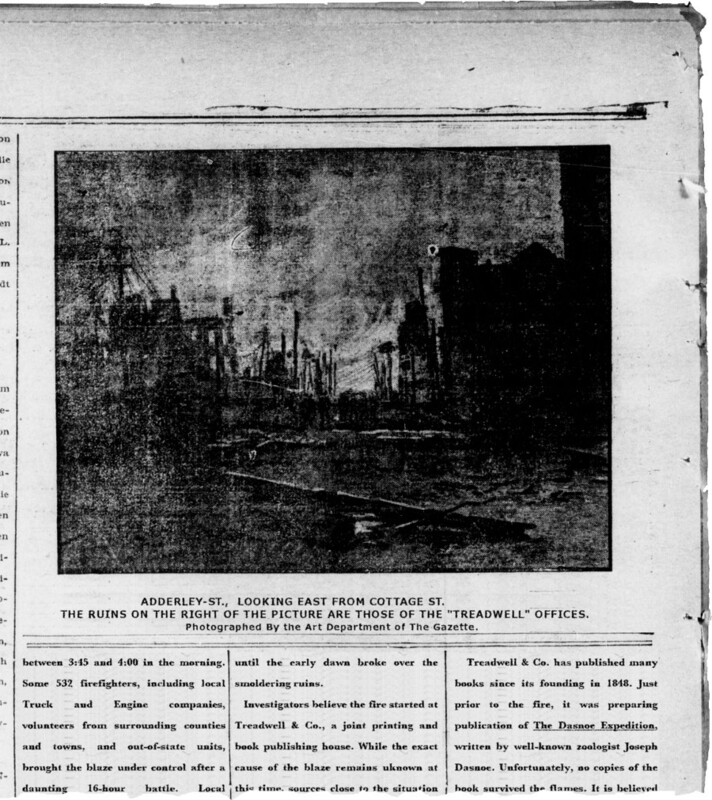 Today, we’re pleased to share the Treadwell Fire article with you. 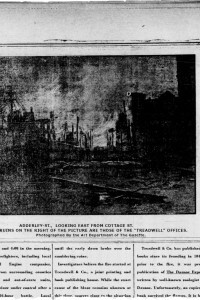 Originally featured in The Gazette, it was the first article to go to press detailing the infamous Treadwell Fire of 1904 that ripped through Newark, New Jersey, killing 56 people and leveling some 500 structures in its wake. Historians have yet to definitively link the fire to the Corbotch empire. However, many conspiracy theorists are quick to point out the fire’s likely origin point—the Treadwell offices—as well as Joseph Dasnoe’s connection to those offices. One of my goals for 2015 and beyond is to start publishing more stories. Ideally, one every couple of months. While I still intend to write full-length novels, I’d also like to try my hand at novellas and short stories. So, what’s on the agenda for this year? Behemoth: I’ve got two Apex Predator stories in development. The main story, codenamed Behemoth, is ~100 pages long so far. As I mentioned on Monday, I’m using a technique I like to call shadow writing. There’s no outline, no plan. It’s just me writing into the shadows, slowly shedding light on the stories in my subconscious. This past week, I’ve been cycling back a lot, changing and altering things in order to suit where the story seems to be going. June is going to be a busy month for me, but I’m hoping to have a solid draft done by the end of July and in your hands by the end of August. Goal: August 31, 2015. Collapse: The first draft for Cy Reed #5, codenamed Collapse, is done. I think the main story is good, but the subplots leave a lot to be desired. Plus, I wrote the draft prior to finishing Vapor so other things need to change as well. This is another tough one to estimate, but I’m hoping for a four-month turnaround. Goal: December 31, 2015. And what’s after that? I’d like to write a Cy Reed Origins series, chronicling Cy’s shift from archaeologist to treasure hunter / salvage expert. Hopefully, early 2016? This week in Cryptic, the Infinity mystery deepens. Why did eight wealthy children leave their Manhattan apartments late at night? And how did they disappear without being spotted? 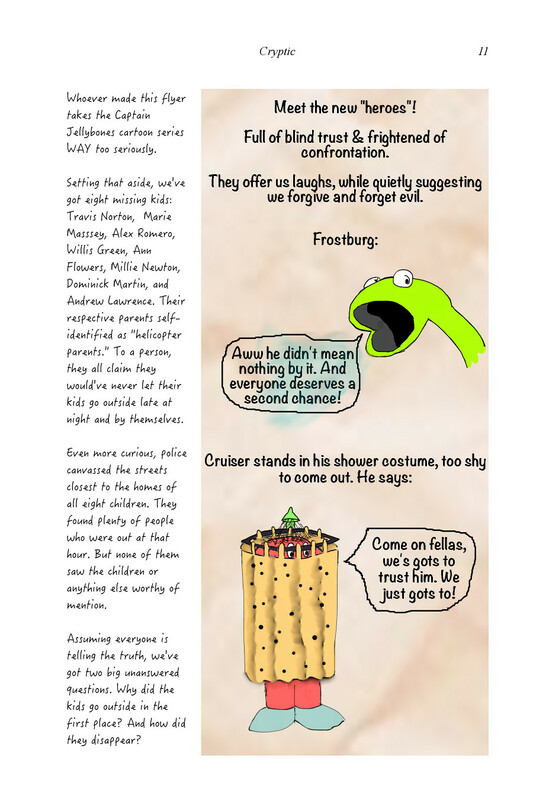 We’re pleased to release our 11th page of Cryptic today. Cryptic is our working title for Cy’s personal journals during the time period encompassed by Chaos. It focuses largely on his side investigation into a mysterious—and dangerous—group known as the Infinity. This week’s entry, “Infinity Mystery Deepens,” is the third of a four-part mini-series. Here’s the first part. And here’s the second part. “Infinity Mystery Deepens” contains the second inside page of a flyer Cy found just outside the 51st-53rd Street station complex. 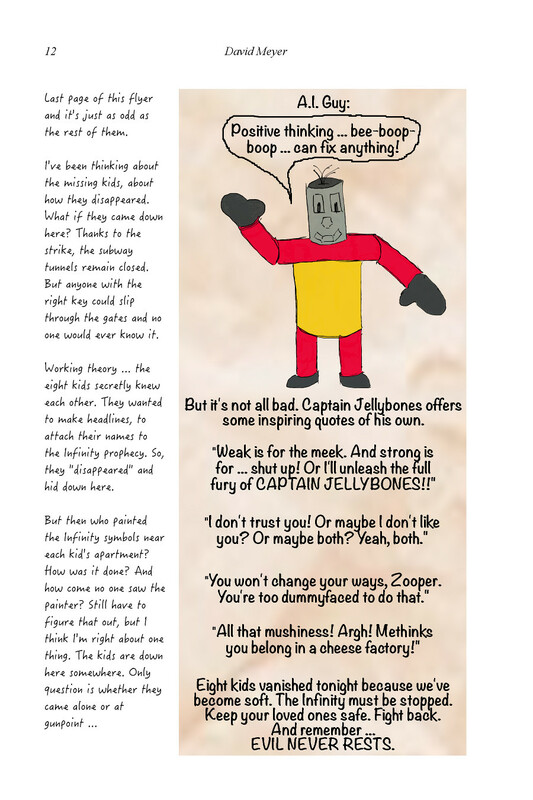 Like the other pages, it depicts characters from Captain Jellybones, a popular Internet cartoon series. An unknown person created the flyer in order to call attention to the disappearance of eight children from extremely wealthy Manhattan-based families. In his notes, you can see Cy begin to puzzle how eight kids, watched over by so-called “helicopter parents,” disappeared from their respective apartments without a trace. Were they kidnapped by the Infinity? Did they go via their own free will? If so, why? By now, most of you have read Vapor, the fourth novel in the Cy Reed Adventure series. And Cy Reed #5, currently titled Collapse, shouldn’t be too far behind it. The first draft is already finished, although the subplots still require a good deal of work. But first, Apex Predator is on its way. Apex Predator is my newest world and will be a significant departure from Cy Reed, most notably in how I’m writing it. I’m using a technique I like to call Shadow Writing (aka pantsing, writing into the dark, free writing, etc.). This time, there’s no outline, no plan. It’s just me writing into the shadows, slowly shedding light on the stories in my subconscious. I also stopped writing to a word count. Now, I’m writing in two-hour blocks with no word count guarantees. As of today, I’ve got ~29,000 words—116 pages—in two separate stories. One is smaller, more intimate and full of menace. The other is action-packed and crammed with mysteries. I’m not totally sure where each one is going yet, but I think they’re going to be some of my best stuff yet.